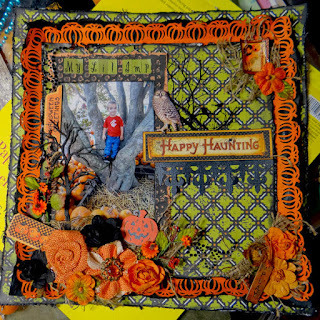 Hello Ladies, well its hard to believe we are coming to the end of another kit, Morticia's wish, what a gorgeous kit with scrumptious Halloween colours and trims, Mel you outdid yourself! BRAVO!!!!!! The layout of the month for October, showcases this glorious kit at its best....Heather put together a stunning example of work! Well done Heather, this is so striking and stunning! Great Job. ~Michelle - Mistress of Mayhem!